Regueiro M, Rivera L, Damnjanovic T, Lukovic L, Milasin J, Herrera RJ. Whether present-day European genetic variation and its distribution patterns can be attributed primarily to the initial peopling of Europe by anatomically modern humans during the Paleolithic, or to latter Near Eastern Neolithic input is still the subject of debate. Southeastern Europe has been a crossroads for several cultures since Paleolithic times and the Balkans, specifically, would have been part of the route used by Neolithic farmers to enter Europe. Given its geographic location in the heart of the Balkan Peninsula at the intersection of Central and Southeastern Europe, Serbia represents a key geographical location that may provide insight to elucidate the interactions between indigenous Paleolithic people and agricultural colonists from the Fertile Crescent. In this study, we examine, for the first time, the Y-chromosome constitution of the general Serbian population. A total of 103 individuals were sampled and their DNA analyzed for 104 Y-chromosome bi-allelic markers and 17 associated STR loci. Our results indicate that approximately 58% of Serbian Y-chromosomes (I1-M253, I2a-P37.2, R1a1a-M198) belong to lineages believed to be pre-Neolithic. On the other hand, the signature of putative Near Eastern Neolithic lineages, including E1b1b1a1-M78, G2a-P15, J1-M267 and J2-M172 and R1b1a2-M269 accounts for 39% of the Y-chromosome. Furthermore, an examination of the distribution of Y-chromosome filiations in Europe indicates extreme levels of Paleolithic lineages in a region encompassing Serbia, Bosnia-Herzegovina and Croatia, possibly the result of Neolithic migrations encroaching on Paleolithic populations against the Adriatic Sea. Coastal and Danubian expansion sandwiching paleo islands. There is the belief now among some that Haplogroup I2a2-M423 was brought to the Balkans by Slavic speakers. This belief attempts to challenge the older belief that this haplogroup was native to the southern Balkans in Paleolithic times. Some are saying that there is greater haplogroup I2a2 diversity in Ukraine, which indicates a homeland for the haplogroup. 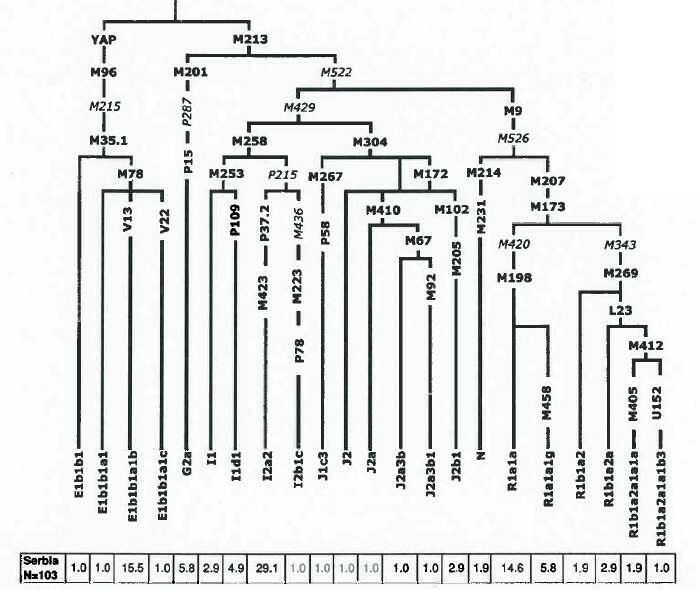 There is also the belief that the MCRA is young, meaning that the haplogroup could not have been near Serbia in ancient times, and finally, that this haplogroup is not seen much where there was ancient Greek colonization. I am not in a position to evaluate these beliefs, but if they are true, the lesson is that there is always more to learn, and that unless there is overwhelming evidence, there should be qualification in statements. 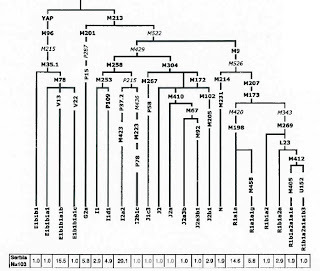 (ii) Ignoring the sub-haplogroup level resolution deficiency. As to (i), within the groups listed, only the E and J branches are commonly associated with the neolithic (and even they have timing problems). And why are the particular R1a sub-branches here paleolithic, but the R1b sub-branches are not - when most have been shown to be completely different from Anatolian ones, at equivalent time slices? As to (ii), we now know that G2a2b (!) is at least 5,300 years old. I would say, likely 7,000 - 8,500ya to match the beginning of Europe's neolithic. And we have not even dug deeper. In five years, this may be designated G2a2b3c1am, for all we know. In other words: it's way too early to talk about population movements when we cannot even resolve most ancient DNA sub-groups and relate them properly to today. "there should be qualification in statements"
Coastal and Danubian expansion sandwiching paleo islands? Dean, you're correct. Rootsi et al in 2000 & 2004 proposed that I21b (I think that's what it's called now) (ie the "Balkan" Hg I) dated it to 8 kYa (post Glacial). However, it was based on Zhivotovsky method, so it could be conflated by a factore of 3 to 4. So it could really date to 2 kYA, ie early first millenium. Moreover, Rootsi et al provide no evidence or data for the supposed great diversity of Hg I2 in Bosnia/ Dalmatia. It is far more parasiminous that the high diversity of Hg I2 in Bosnia reflects recent founding , bottlenecking and/or drift events with subsequent fixation. Its pattern of central-northern Balkan (incl northern Greece but not Albanians) and lower Danube - North Pontic region screams, intuitively, of something related to Slavic demographic phenomena.